If you grew up and went to school in the US, then you were, at some point, more likely than not required to read F. Scott Fitzgerald’s 1925 novel, “The Great Gatsby”, the book about which the term “the great American novel” was coined. This fact allows me to talk about the movie without worry that I’ll be spoiling any of the plot for most of you. With reference to the movie itself, if “living well is the best revenge”, then Fitzgerald’s protagonist, Jay Gatsby, certainly got his. In the case of Baz Luhrmann’s film, a $51 million plus opening against Marvel’s juggernaut Iron Man 3 is the best revenge against the tepid reaction from most critics. 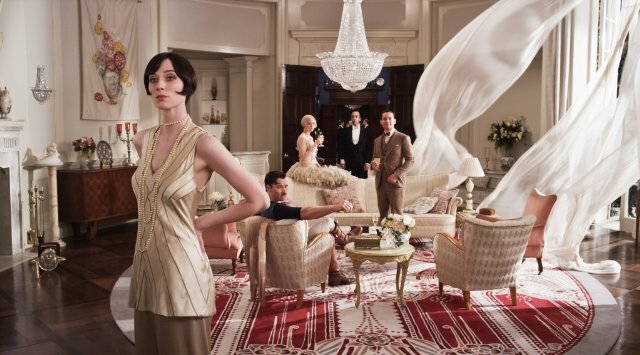 Luhrmann’s huge, lavish production of The Great Gatsby, which just opened in the US (ahead of its European debut as the opening night film at this year’s Cannes Film Festival) this past weekend, was originally scheduled to hit theaters Christmas Day 2012. There was a lot of speculation that the rescheduling meant trouble, as it so often does. I’m actually glad that Warner Brothers made the decision. While it would have been fun to see Leonardo DiCaprio go up against Leonardo DiCaprio at the box office, The Great Gatsby probably would not have shared much of its audience with Django Unchained. It would, however, have shared it with Les Miserables. (Not to mention awards attention with the likes of Silver Linings Playbook.) Opening it in May, at the start of summer block-buster season, at least gives us a little variety at the multiplex. The story has been filmed three times before, four if you count a 2000 made-for-cable version, which despite the presence of a notable cast, including Toby Stephens as Jay Gatsby, Mira Sorvino as Daisy and Paul Rudd as Nick Carraway, was even more tepid than the most memorable version from 1973. That one starred Robert Redford (in his most glorious prime) and a waif-like (even though she was pregnant at the time) Mia Farrow. I remember that version primarily because it introduced me to the mansions of Newport, which stood in for Jazz age Long Island. Bit of trivia: director Jack Clayton served as associate producer on John Huston’s Moulin Rouge, also the title of an indelible Baz Luhrmann film – which brings me back around to the current topic of discussion. The 2013 incarnation of The Great Gatsby is a grand spectacle. It’s flashy, trashy, twirling, swirling, raging and raucous (yet sweetly sentimental), gin and champagne soaked decadence. And it’s in 3D! As Fitzgerald’s omnipresent Greek chorus-like narrator, Nick Carraway says in wide-eyed wonder, “It’s like an amusement park.” He’s describing but one of Jay Gatsby’s parties, but it also describes the movie itself. Anyone who’s ever seen a Baz Luhrmann film should know going in what to expect. Starting with what is still one of my favorite movies of the 1990’s, Strictly Ballroom, with a finale that includes an inspired paso doble (before “Dancing with the Stars” made it ubiquitous), continuing through his modern take on Shakespeare, the multicultural Romeo + Juliet set in Verona Beach, Florida, the aforementioned musical Moulin Rouge (which Gatsby most closely resembles if for no other reason the anachronistic soundtrack) with John Leguizamo as Toulouse-Latrec singing Nat King Cole of all things, and the hyper-romantic Australia, meant to evoke the grand passions of Casablanca, the director’s filmmaking style is pure rococo. It’s ornate, highly-stylized and always over the top. The watch-word is excess. You either enjoy it or you don’t, but one really shouldn’t expect anything different just because he’s turned his hand to, arguably, the greatest example of 20th century American literature. The story, of course, concerns the mysterious Jay Gatsby (Leonardo DiCaprio). Everyone knows he’s rich, but where did the money come from? The origin of Gatsby’s fortune is the chief subject of gossip among the rich and fabulous New Yorkers who frequent his many equally fabulous parties. Nick Carraway (not rich and not fabulous) admires Gatsby, whom he regards as a fellow self-made man, unlike his beautiful cousin Daisy Buchanan’s husband Tom (Joel Edgerton), an arrogant brute, the scion of a wealthy family who plays polo and cheats on his wife. On the outside looking in, Nick (Tobey Maguire) finds himself drawn into their gossamer web when Gatsby learns his new neighbor’s connection to the woman of his dreams and asks him to arrange an assignation with Daisy (Carey Mulligan), his long lost love (and obsession) who embodies his most cherished aspirations. The problem with Luhrmann’s version is the same as the problem with any version of this book. More than the plot or the characters themselves, it’s Fitzgerald’s writing that makes the material “great”. You can’t film Fitzgerald’s words. Not that the director doesn’t try. Among the differences between novel and film (and there are many and that’s okay. They are two separate mediums), the chief conceit here is that not only is Nick Carraway narrating the story for “us” (either reader or watcher), Luhrmann has seen fit to frame the narration with a wholly made-up scenario in which alcoholic Carraway is in a sanitarium and writing the story as well as telling it to his psychiatrist. Typed letters float up on the screen to form words, whole passages are written on the screen. It’s unnecessary, as well as not a little insulting to his actors. When he allows his cast to just act, they reward him, and us, handsomely. Leonardo DiCaprio, who worked with Luhrmann in Romeo + Juliet (and was to follow that up with a version of Alexander the Great which was scuttled after Oliver Stone’s version tanked), is a sympathetic and romantic Jay Gatsby, his boyish good looks and charm used to great effect. His continued use of the term “old sport” as an endearment starts to grate the more that we hear it as the movie goes on, because we’re also learning more about the character and we realize what an affectation it is. If his accent seems to slip in and out, I think it’s a conscious choice on the part of the actor. It slips when he’s frustrated, especially after he’s revealed his past to Nick. His accent is a manifestation of the mask that he wears. Nick sees him as the epitomy of hopefulness and that attitude is clear in everything Gatsby says and does, even in his nervous disappearing act during the “tea-party” he has Nick arrange for Daisy. Joel Edgerton is perfect as the well-heeled, narrow-minded bully, Tom Buchanan. His mustache, I must say, goes a long way toward conveying the menace he embodies. Isla Fisher is wonderful as Myrtle Wilson, Tom’s blowsy mistress from the other side of the tracks. (Her LonG Island accent is hilarious.) She’s as Technicolor as Daisy is pastel. I would have liked to have seen more of her. Jason Clarke is Myrtle’s husband George, more tragic than mean-spirited. Clarke, Fisher and Edgerton are all Aussies and (with the exception of Edgerton) must have taken the small parts in order to work with a fellow countryman. Luhrmann filmed his opus in Sydney as well. Elizabeth Debecki, who plays Jordan Baker, is an Australian actress with just one feature to her credit before The Great Gatsby, but she clearly holds her own with the veterans of the cast and blows Tobey Maguire, with whom she has the majority of her scenes, right out of the Duesenberg. Let’s talk about Tobey Maguire. I’m at a loss to explain his appeal, if indeed he has any. I wasn’t especially impressed by his Spider-Man, and after finally catching up with Andrew Garfield’s incarnation, I’m even less so. His Nick Carraway makes even the stoic Sam Waterston’s look like King Lear. He’s a cipher, a non-entity, either as a participant to the proceedings or as a witness (never entirely “within or without”). I suppose one could presume he got the job because of his life-long friendship with DiCaprio. Who knows? Speaking of Leo, despite his self-possessed star turn, the real star of the movie is the production design. I predict there will be Academy nominations for Catherine Martin for both the production and the costumes, as well as Ian Gracie for art direction and Beverly Dunn for set design. Flawless down to the last bugle bead. Did I mention the movie is in 3D? Anyone who knows me, knows I’m not exactly a proponent of this bit of technological wizardry. I could not imagine why a movie without explosions and battles and the usual reasons for stuff to fly at one’s face would need to succumb to the temptation. If the choice had been mine, I would have opted to purchase a ticket for a 2D showing, but I saw an advance preview and it was shown to us in 3D. While I have no doubt that it would be nearly as lush in the conventional format, the enhanced version wowed me from the opening frame, which was snow falling in front of a frost-rimed window with Tobey Maguire visible behind it. It looked like a snow globe. 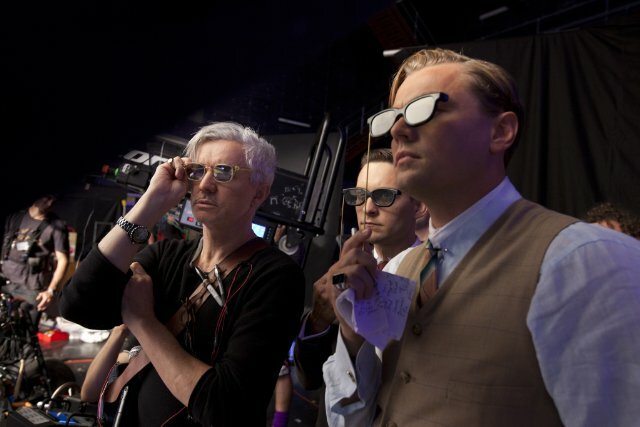 Luhrmann and his cinematographer, Simon Duggan, use 3-D in a way I’ve not seen it used, to show depth of field. A scene in which Nick, Jordan, Tom, Daisy and Jay are all in the Buchanan sitting room with the curtains blowing, looks like the center of a pop-up story book. It’s gorgeous, but it does serve to keep the audience, for the most part, at arms-length, preventing a lot of real emotional connection. Which is not to say that the movie isn’t filled with sensual delights, like the orgiastic raves Gatsby throws night after night in an attempt to lure Daisy to his nest. One can almost smell the boat-load of flowers that fill Nick’s charming little cottage and taste the mountains of pretty confections that Gatsby has provided for that simple tea party. It is an ode to excess. Those are the things that work. It’s the story’s complex, almost delicate moral underpinnings that get short shrift. Hedonism is easier and much more fun to depict than the main theme of the novel which is less romantic. “The Great Gatsby” is a highly symbolic meditation on the disintegration of the American dream. Set in an era of unprecedented prosperity and material excess gives it a relevance for today’s audiences. Fitzgerald’s novel is set in the 1920s as an era of decayed social and moral values, characterized by cynicism, greed and a reckless, empty pursuit of fun, which, while epitomized by the opulent parties that Gatsby throws every Saturday night, should seem familiar. Gatsby instilled Daisy with a kind of idealized perfection that she neither deserved nor possessed and his dream is ruined by the unworthiness of its object, just as the American Dream was ruined by the empty pursuit of money and pleasure. Luhrmann spent so much time getting all the details of the decadence right, he forgot that we weren’t supposed to enjoy it so much that we miss the lesson. This entry was posted in 3D, movie reviews, movies, Musings, novels to film and tagged 3d, baz luhrmann, carey mulligan, F. Scott Fitzgerald, leonardo dicaprio, movie review, The Great Gatsby, tobey maguire. Bookmark the permalink. This is a book-to-film adaptation that may or may not win over fans of the book, but may just piss a lot of people off. Good review S.A.